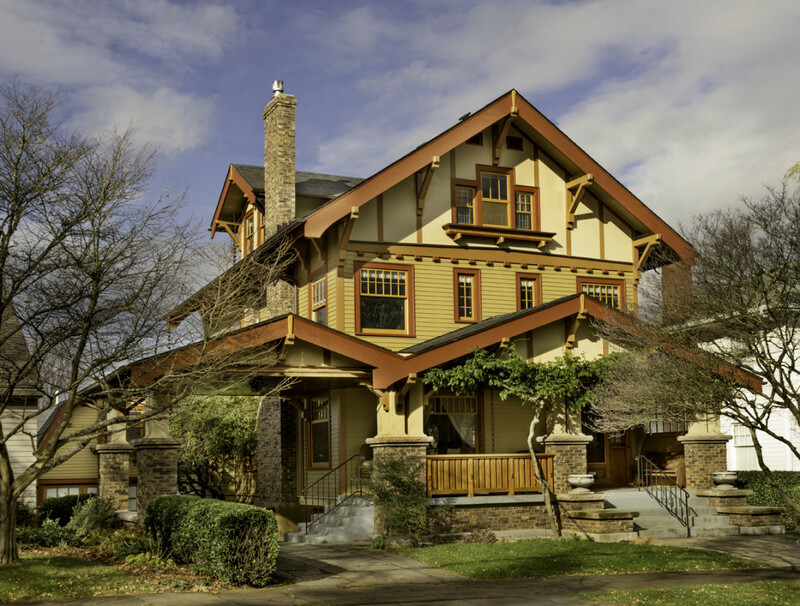 The restored exterior of the 1911 Ferdinand E. Reed House in Portland, Oregon, is painted in a period-inspired fall palette. Many years ago, Nancy Conescu lived in a Brooklyn neighborhood where she and friends scoured the curb on trash night, looking for funky furniture and other discards. 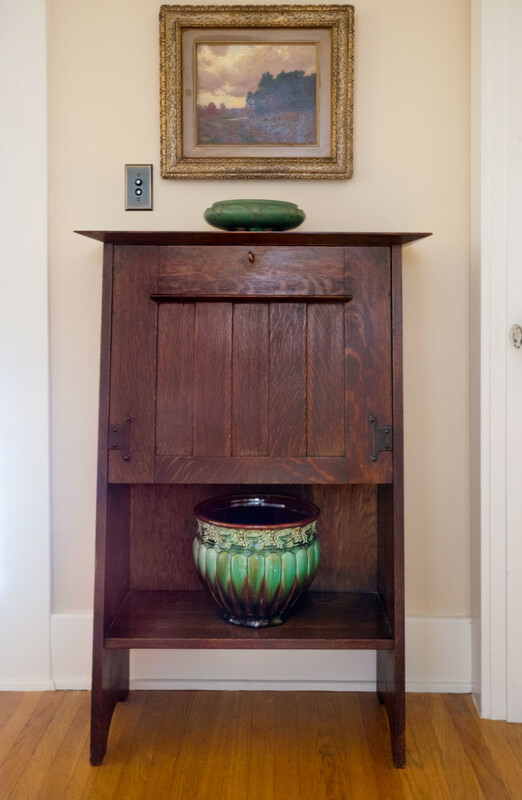 While she was at a gig (Nancy is a guitarist and singer of traditional Irish music), “my friends crawled into the basement of a condemned building and rescued a beautiful little mahogany desk with carved tobacco-leaf panels.” They gave the desk to Nancy. The very next day, the condemned building was demolished, along with everything in it. 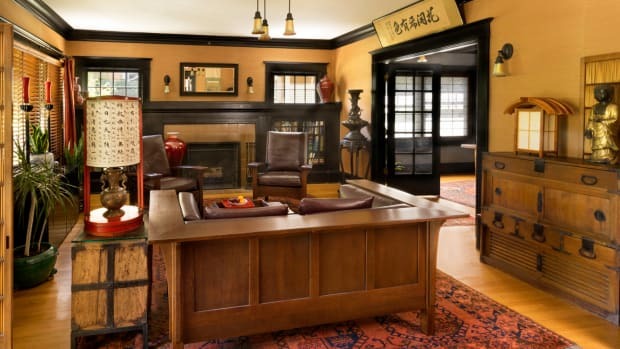 The Stickley desk rescued from a condemned building is lit by a van Erp desk lamp with stenciled shade and a Gustav Stickley harp lamp. The new built-in bookcase is topped with Teco, Roseville, and Grueby pottery. 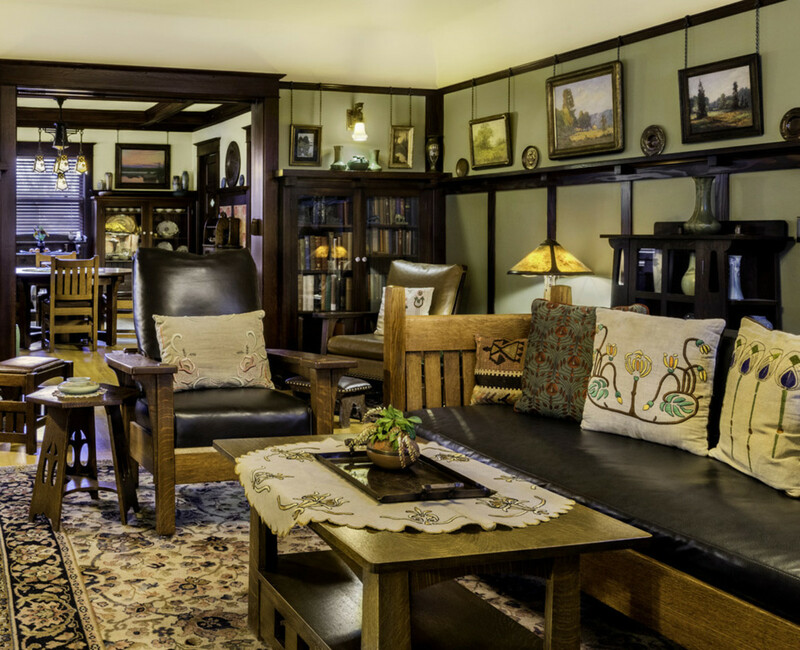 The daughter of New York architect and contractor the late Herbert Cohn, Nancy knew from the moment she stepped into the Ferdinand E. Reed house in Portland that it needed serious renovation and restoration. She told her husband, Mike Doolin—a guitar maker, musician, and recording engineer—that she would be the contractor in charge. An L. & J.G. Stickley paddle-arm Morris chair flanks the Gustav settle. The Peacock floor lamp at far right is vintage Handel. 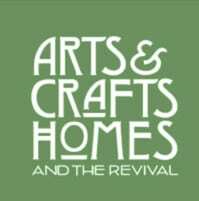 Nancy’s friend Martin Munske, who owns the Portland-based renovation company Das Haus, shared her interest in restoration and thus became job foreman and chief advisor. First off, they hired electrician Todd Eccles to replace the old knob-and-tube wiring, and plumber Mladin Arapovic to bring the house up to code. Systems upgrades alone took nine months of work. Under a “no-name” painting, the drop-front desk displays Weller pottery. Next came the exterior. 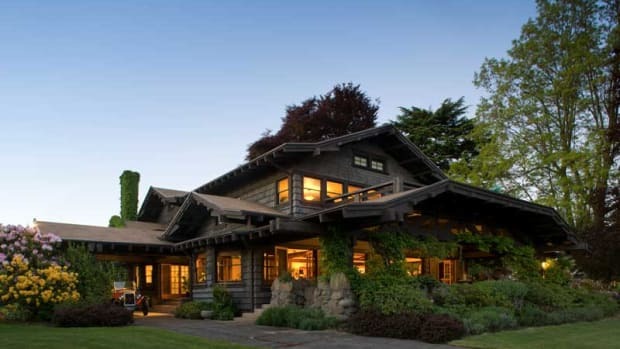 During the 1980s, the original shiplap wood siding had been covered with aluminum. When Munske pulled off a section of the later siding, he and Nancy were shocked by the ruined condition of the wood beneath. For the next 21 months, Munske and crew tore off the aluminum and rebuilt the exterior (insulating walls, replacing damaged stucco, rebuilding the crumbling chimney), then installed new shiplap. They also rebuilt the porch façade and added brick piers under the columns. Nancy designed a new railing with built-in seating. “The roof was sagging on each side of the house,” Nancy adds, “so I designed support beams and corbel brackets to hold up the roof.” The roof of the 1920s carport was not tied into the original roof on the house; new fascia boards now create a uniform roofline. On a Limbert table sits a Limbert lamp with a reproduction shade by Luke Marshall. Copper trays are by van Erp and Avon. 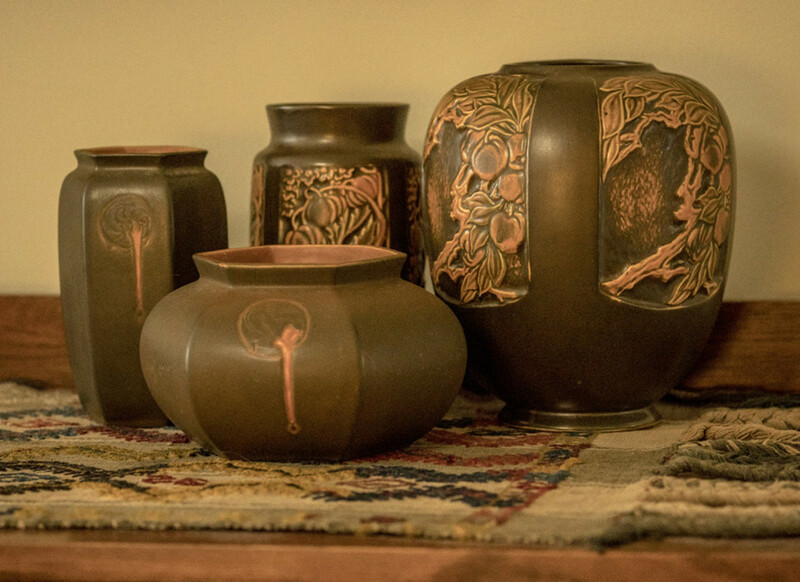 Nancy’s passion for Arts & Crafts pottery influenced her design for the living room. She installed a skeleton wainscot topped by a plate rail to provide more display area. 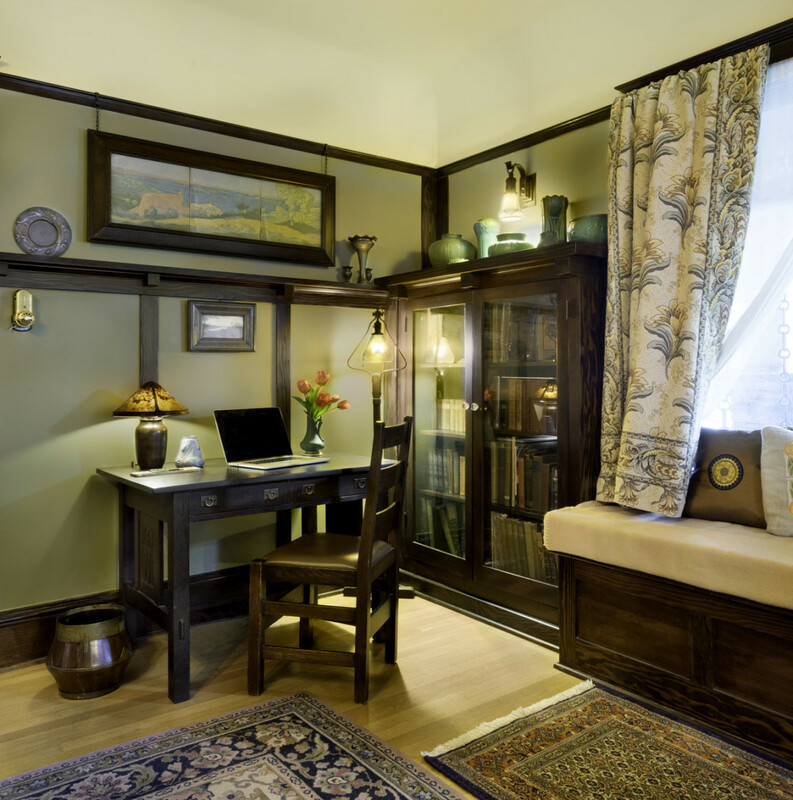 Then she designed a built-in window seat between two bookcases, matching originals on the other side of the room. 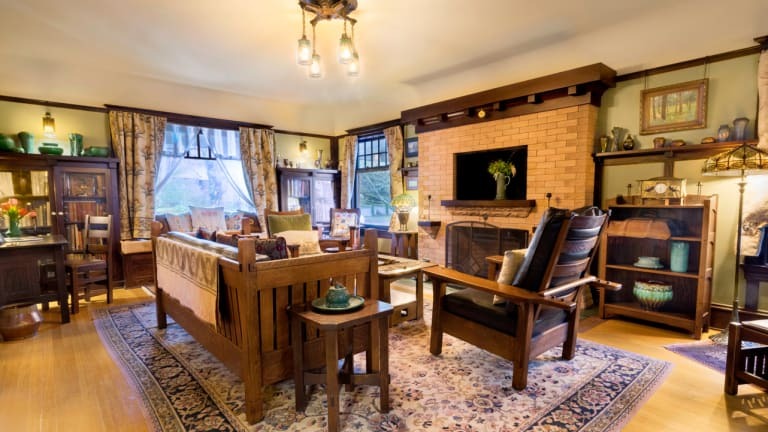 “The most ‘original’ rooms are the front hall and dining room, both of which have box-beam ceilings,” Nancy says. 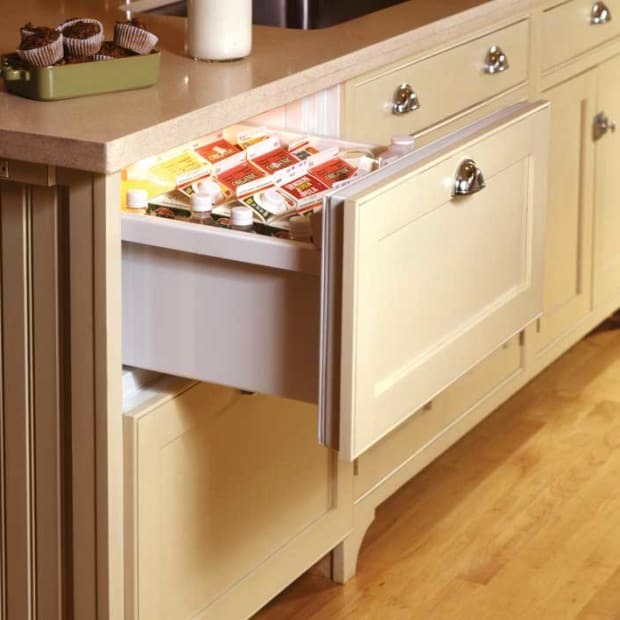 The dining-room buffet that recedes into the kitchen wall is original, as is the wainscot with widely spaced wood battens, copied for the living room. The second owner had added three china cabinets ca. 1930; when she removed their glass backing, Nancy discovered a lining of newspapers dated Jan. 20, 1928. Original built-ins flank the wide opening to the dining room. As renovation proceeded, Nancy says she had a vision of how the house would look. An intrepid buyer and seller of antiques (she keeps going until she gets just the right thing), Nancy regularly attends auctions in person and online, peruses eBay, and hunts for Arts & Crafts pottery through favorite West Coast dealers. 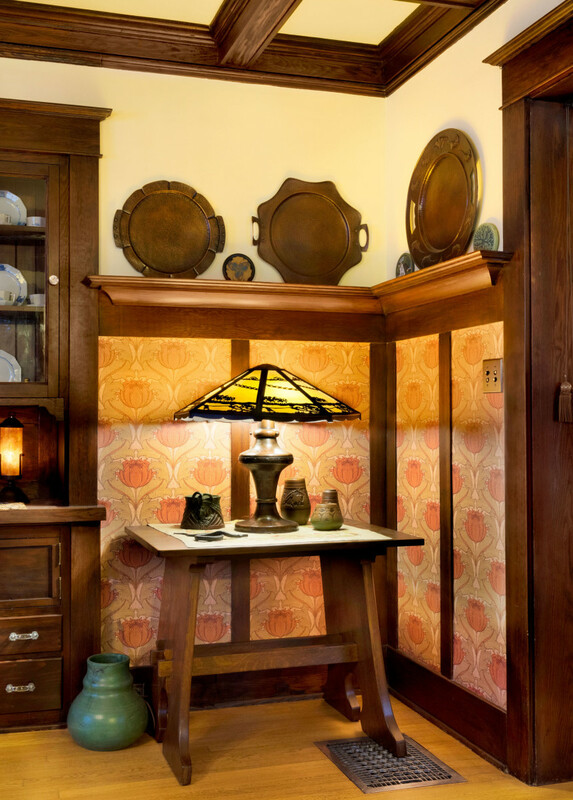 “Pottery is my first passion,” says Nancy, but “I’ve got a thing for beautiful lighting, too.” Although many of her furnishings were produced by well-known makers including Gustav and L. & J.G. 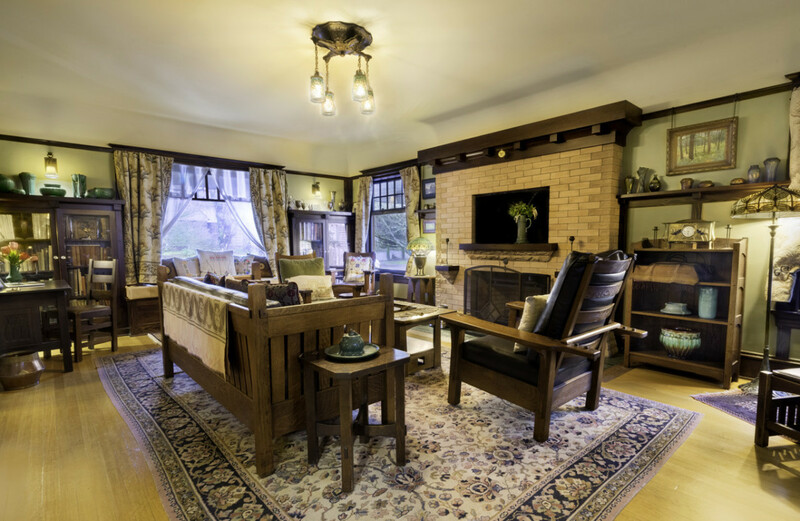 Stickley and Charles Limbert, some of the “no name” pieces are at the top of her favorites list. 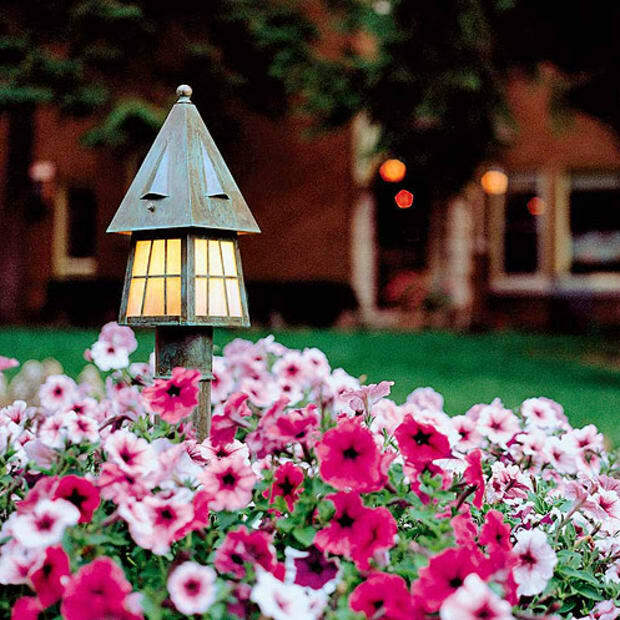 The vintage Japanese garden lantern still has its original, crumbling orange paper. Nancy replaced original but uninspired brass lighting with Handel fixtures. She did, however, recycle Steuben glass shades from the old dining-room ceiling light, using them on four bronze sconces she added to the living room. With infrastructure rebuilt and major decorating done, Nancy and Mike are finally enjoying the beauty of their home, its restoration a product of seeds planted on trash nights decades ago. With elements dating to 1911, 1930, and 1951, the kitchen was in good shape. This owner upgraded casing trim, added the cut-away doors under the sink, and replaced contemporary lighting with vintage Art Deco fixtures, playing up the 1930s look. Buck’s Stove Palace in Portland provided the restored and retrofitted Quick Meal stove. 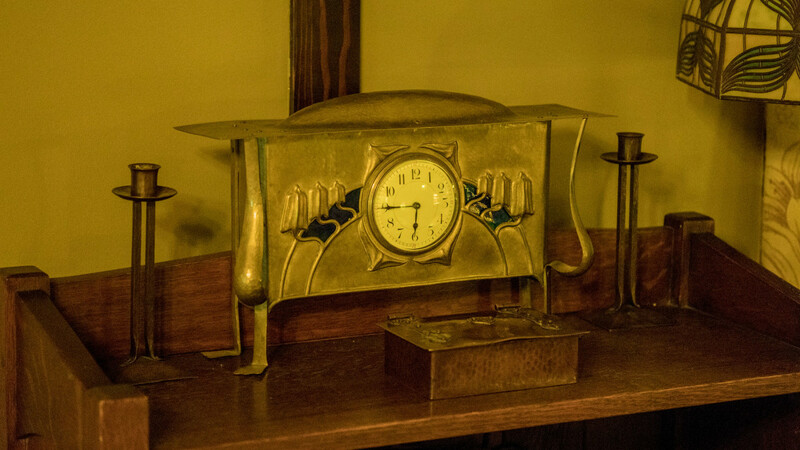 An English brass clock is accompanied by a Dirk van Erp box and Roycroft candlesticks. FOCUS! 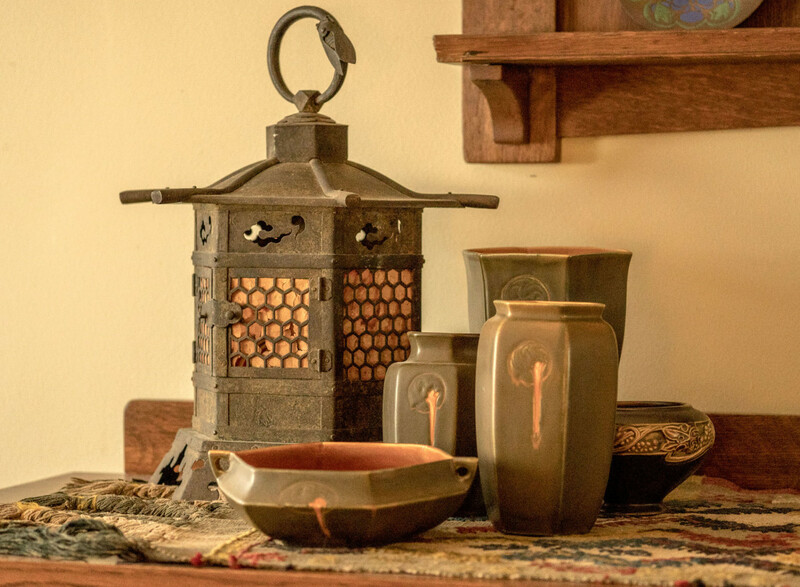 Homeowner and collector Nancy Conescu loves paintings, but her interest in them pales in comparison to her passion for pottery. Solution? “Buy a painting you like that has no particular provenance; the money you save can be invested into the pottery you love.” EDUCATE YOURSELF If a particular artist or manufacturer interests you, really study their history. Become an informed collector so that you can identify unrecognized treasures. HORSETRADE Buy what you can afford now. 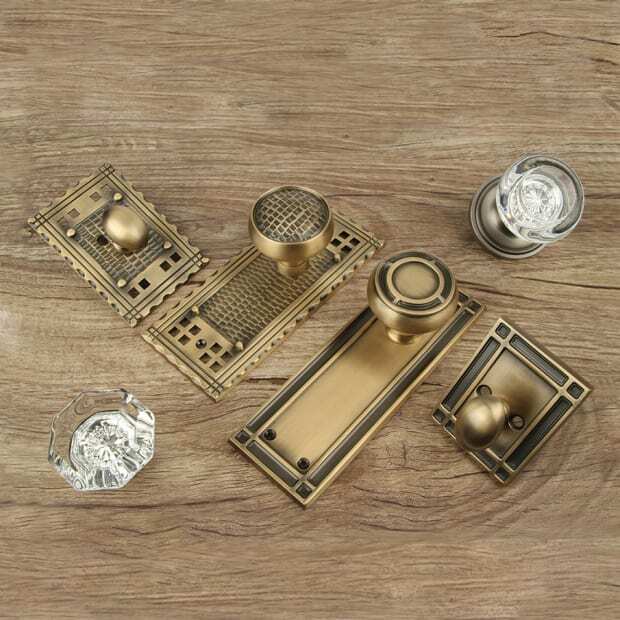 As your collection grows and your tastes change, you can trade or sell off pieces to reinvest in more desirable items as they come along. When dealers get to know you, they’ll give you a heads-up when their inventory includes items of special interest. 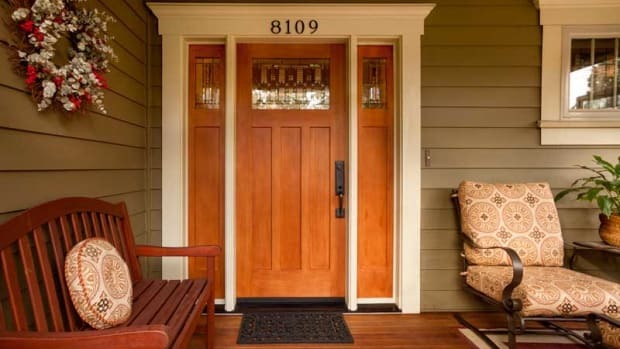 After spending a decade restoring a 1908 house, this couple was pleasantly surprised to find they’d fallen for a newer Craftsman—one built in 2008!